Have you made overnight oats yet? Friends I am completely sold on this make ahead, healthy, protein packed, great for on the go breakfast option. 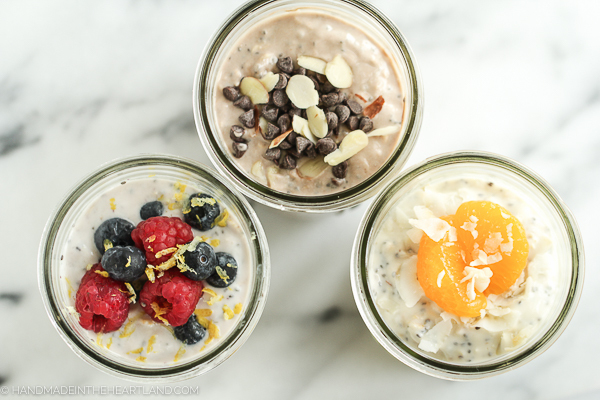 Today I’ve partnered with AE Dairy, my favorite midwest dairy brand, to bring you three different ways to enjoy overnight oats! 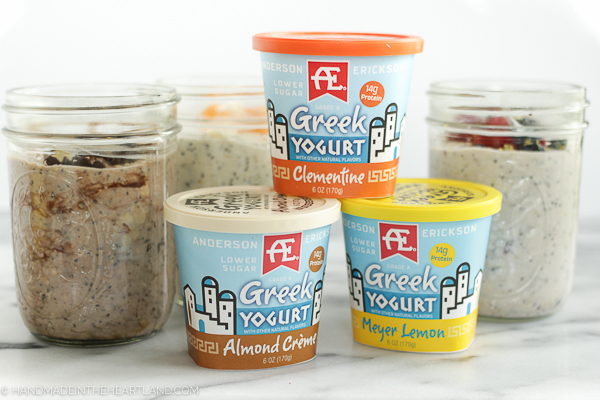 I love using AE Greek Yogurt for these recipes, they add 14 grams of protein and the different flavor varieties make my recipes delicious! In these recipes I used the almond creme for my chocolate almond, the meyer lemon for lemon berry and the clementine greek yogurt for the orange coconut. Overnight oats start with a simple recipe that is easy to add different ingredients to for a variety of flavor combinations. I love these recipes because they keep me full until lunch. I’m always looking for breakfast options that are filling enough to keep my body going for several hours and with school starting I’m sure you are all in the same boat. My husband started dental school on Monday and he’s been enjoying these for breakfast, I’m hoping my kids will eat them as well! Easy To Make Ahead! Take 10 minutes to mix up your ingredients the night before and have breakfast the next day and for a few days after. Easy To Take On The Go! Pop them in the fridge in mason jars or plastic containers that you can grab on the way out the door. Filling and Healthy! 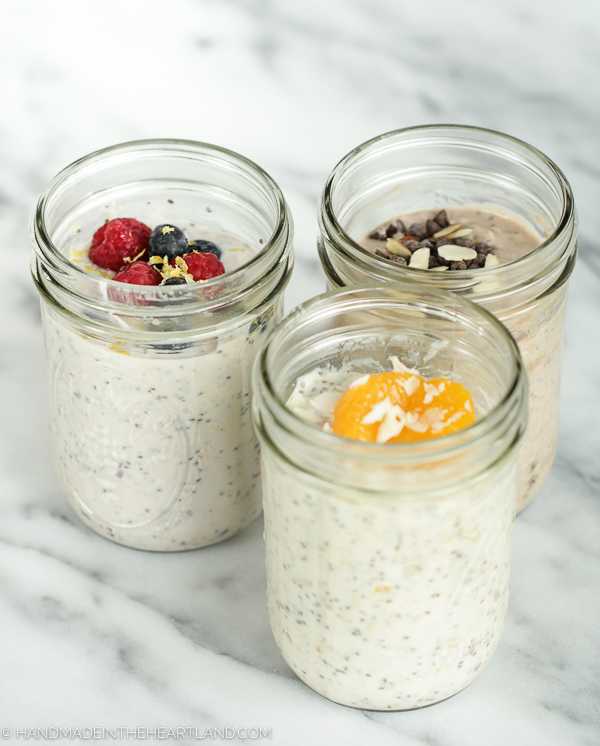 These Overnight Oats recipes are packed with great ingredients like chia seeds, nuts and delicious greek yogurt that keep you full and fueled until lunch! The first time I experimented with overnight oats was earlier this summer. I’ve been trying to eat healthier and the key to healthy eating is meal prep! If I’m caught hungry without a plan I always choose a less-healthy option. Overnight oats are awesome because you can make 3-4 on Sunday night and eat them throughout the week. Below is a recipe for basic overnight oats, you can see how easy it is to change the combinations! 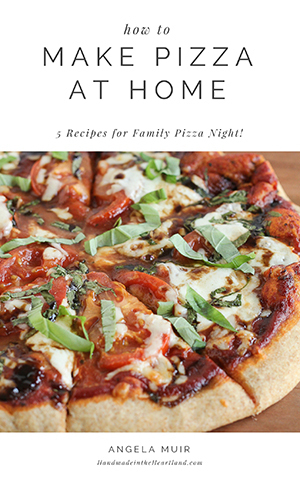 Click on the below links for recipes for the 3 delicious combinations I’ve created for you! These recipes are filled with protein and healthy ingredients to keep you full and fueled until lunch. 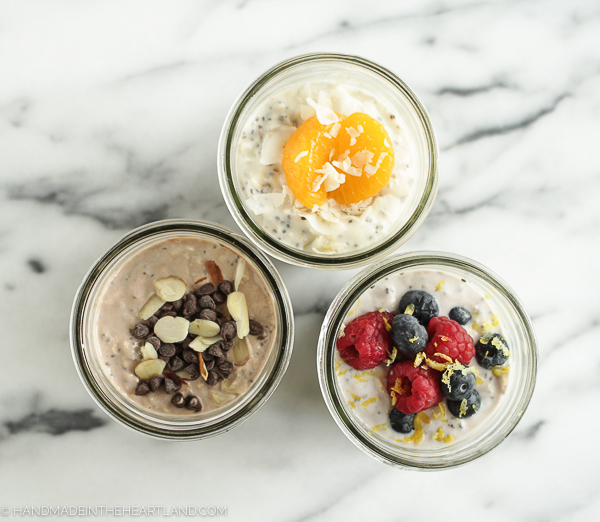 Overnight oats are the perfect on the go breakfast option! This basic recipe for overnight oats is the perfect blank slate to try different flavor combinations! 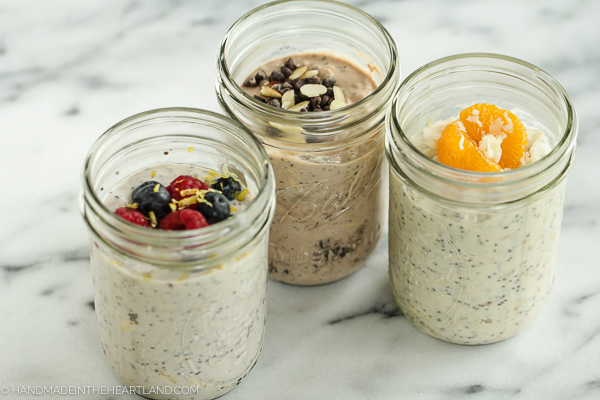 Overnight Oats are the perfect make ahead, on the go, healthy and filling breakfast! 1 Tbsp other mix in like shredded coconut, chocolate chips, etc. I would love to hear your favorite combinations for overnight oats! I’d love to hear in the comments or tag me on Instagram (@handmadeintheheartland) or Facebook! There are endless combinations to try so please give me some more ideas! Most of you know that I love AE Dairy! Every product is top quality and delicious, these yogurt flavors are so good and completely perfect by themselves for breakfast. If I’m not mixing them up into overnight oats I love them topped with some granola, seriously good yogurt! Keep up with AE Dairy on their social channels for great news on all the yummy goodness. Need to save these for later? Pin the images below!